We’re proud to recognize the impact Friends of the Foundation donors like you have on young adults experiencing homelessness. Thanks to your generosity, people in our communities are changing their financial lives for the better. At NWCUF’s October 2017 Donor Appreciation Breakfast, we were inspired to see so many Friends of the Foundation come together to assemble move-in kits for Crosswalk, an organization dedicated to breaking the cycle of youth homelessness. 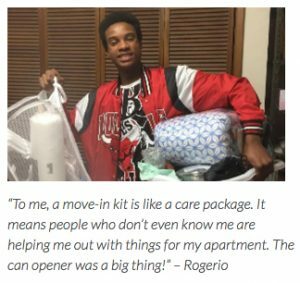 Because of donors like you, these kits already have helped seven young people feel at home as they transition from homelessness into their own apartments. Thank you for living the credit union spirit through this and so many other initiatives. Your contribution to the Northwest Credit Union Foundation continues to touch hearts and to strengthen communities.